GREENWOOD VILLAGE, Colo., Jan. 24, 2018 /PRNewswire/ -- Huddle up! Red Robin Gourmet Burgers and Brews is opening its playbook to make burger fans the most valuable host of their Big Game parties this year. Available now at participating Red Robin restaurants nationwide, the Gourmet Burger Bar comes with 10 or more fire-grilled, made-to-order burgers that can be customized for guests to create their ideal burger. Ready to order? 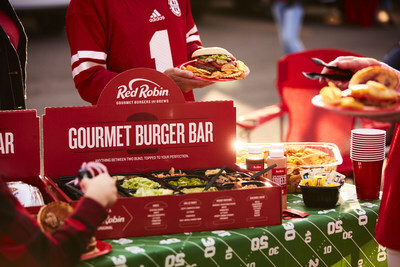 Call your local Red Robin restaurant today and receive a free $10 gift card when you purchase a Gourmet Burger Bar for pick up from Feb. 2 – Feb. 4. Pricing varies by location with a 10-burger minimum. Additional burgers can be added in increments of five. Plates, serving utensils, napkins and cutlery kits are included with every Gourmet Burger Bar. If the Gourmet Burger Bar is not in your game plan, Red Robin is also offering a 20 percent discount on all to-go orders from Feb. 2 – Feb. 4.